Malaysia & Indonesia Events Management Company | Entertainment Booking Agency | Live Concerts | Entertainment Events Planner | Events Entertainment Services | Stage Live Performance | Annual Corporate Events Organiser | Personal Private Party in Kuala Lumpur, Klang, Subang Jaya, Petaling Jaya, Shah Alam, Johor Bahru, Jakarta, Bali, Bandung, Surabaya, Manado, Semarang, Kota Bharu, Seremban, Damansara, Port Dickson, Kelantan, Pahang, Penang. Looking for an Excellent & Experienced Entertainment Planner to Realize Your Dream Event? Anywhere, Anytime, Any Occasion. Let Us Know What’s In Your Mind. We’ll Organize It & Make Your Jobs Even Easier. Best Deal & Better Solution to Meet Your Maximum Satisfaction! SP Entertainment are mainly present, provide and manage a dedicated team of professionals, famous, experienced and skilled performers together with excellent technical supports for event and production in all segments of entertainment industry. These include recording artists and celebrities, band with musician and vocalist, dancers, comedians, emcees, DJs, and other kind of entertainers such as clown, and even tattoo or face painters, or security bodyguards for any functions, events or occasions. We are committed to bring together the ideas that suit your events, products, requirements, needs, budgets and make your event success. 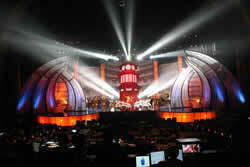 Just from a small party at home till a big stage live performance on TV. No matter for Personal or Corporate purposes such as TV Commercials, Annual Dinners, Gala / Charity Dinners, Awards Presentation, Theater / Musicals, Celebrations, Anniversary, Products/Events Launching, Exhibitions And Trade Shows, Opening & Closing Ceremonies, Road Shows, Dance and Musical Productions, Fashion Shows, Concerts, Conventions, Family Days, Birthday / Theme / Private Parties, Hi-Tea or Outdoor Activities With Celebrities, or any Special Function or Occasion.